The European Union and the United States are negotiating the most economically significant regional free trade agreement in history: the Transatlantic Trade and Investment Partnership (TTIP). Publics in Germany and the United States support TTIP and trade expansion in general, especially with each other. But when it comes to specifics, both Americans and Germans oppose many details of this far-reaching initiative. Moreover, they disagree with one another on making transatlantic regulatory standards similar. And, in the United States, there is a striking generation gap in attitudes relating to TTIP. Motivations for backing the deal also differ. Americans, more than Germans, are somewhat more likely to support this trade agreement as part of a broader effort to boost competitiveness with China. These are among the main findings of two parallel Pew Research Center surveys conducted among 953 people in Germany from February 25 to February 26, 2014 and 1,002 people in the United States from February 27 to March 2, 2014. All interviews were done by telephone. The survey was conducted in partnership with the Bertelsmann Foundation, the North American arm of the Bertelsmann Stiftung, a German foundation that promotes international understanding. By more than two-to-one, Germans (55% to 25%) and Americans (53% to 20%) say TTIP will be good for their countries. There is no partisan divide in support for TTIP between adherents of the major German political parties, but more Democrats (60%) than Republicans (44%) in the United States back the deal. And while there is no generation gap on this issue in Germany, young Americans (67%), those ages 18 to 29, are significantly more in favor of TTIP than their elders (45%), age 50 and older. Support for TTIP in principle does not translate into majority backing for some of the key objectives of the negotiation. The TTIP talks are multifaceted. They aim to reduce or eliminate tariffs on all merchandise trade across the Atlantic. Another goal is to remove restrictions on transatlantic investment. And, for the first time in any bilateral trade agreement, TTIP involves an attempt to come up with common technological and regulatory standards for the transatlantic marketplace, wherever possible. Only 38% of Germans and 41% of Americans support the removal of all tariffs on the transatlantic shipment of goods. Just 41% of Germans and 39% of Americans back the elimination of restrictions on transatlantic foreign investment. And Germans and Americans sharply disagree over the most ambitious TTIP objective: making transatlantic regulatory standards as similar as possible. While Americans support such an effort by a margin of four-to-one (76% to 18%), just 45% of Germans agree. A consistent generation gap also exists in the United States around the details of a U.S.-EU free trade agreement. Young people are more predisposed than older Americans to support removing investment barriers and eliminating tariffs. Roughly eight-in-ten Americans under age 30 also back the idea of making product and service standards as similar as possible between the U.S. and EU, perhaps not surprising given the fact that this generation is far less trusting than their parents and grandparents of the U.S. government’s ability to set strong safety and privacy standards. Revelations of spying by the U.S. National Security Agency, including listening in on phone calls made by German Chancellor Angela Merkel, also may have impacted German and American views on regulation of data privacy. A significant share (85%) of Germans prefers European regulation of data privacy, trusting more in their own government’s capacity in this realm than in U.S. regulation. And, in the United States, men, the young, those with a college degree and high-income persons disproportionately lack faith in American standards protecting their data’s confidentiality. Overall, roughly half (49%) of Americans trust U.S. privacy standards. But only about four-in-ten high-income Americans (39%) share that trust compared with nearly six-in-ten low-income people (58%), a 19 percentage point difference in views. There is a similar 14 point divide on the issue between those who have graduated from college (39%) and those without a college degree (53%). Overall, TTIP’s broad goal is to boost transatlantic trade and investment. More than seven-in-ten Americans and Germans see increasing U.S.-EU trade as beneficial, with nearly eight-in-ten Americans supportive of more trade with Germany in particular. However, Americans are, in general, more approving than Germans when it comes to transatlantic investment. Two-thirds of Americans (66%), but only roughly half of Germans (49%), say that greenfield investment, when foreigners build new factories in their country, helps the nation. But nearly three-quarters of Germans (73%) and more than half of Americans (56%) say foreign mergers and acquisitions (where a European corporation buys an existing American one or a U.S. company acquires a German firm) hurt the country. 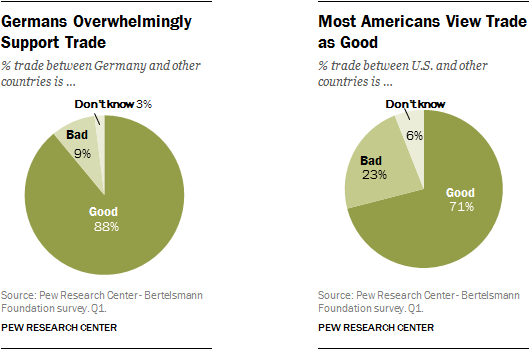 Americans and Germans believe that growing trade between their country and other nations is a good thing. Nearly nine-in-ten Germans (88%) and roughly seven-in-ten Americans (71%) hold such positive views about international commerce. Only 9% of Germans but 23% of Americans voice the view that trade is bad for their country. Such findings comport with past Pew Research surveys that show publics in both countries back trade in principle. But Germans are somewhat stronger supporters of international commerce. Roughly a third (34%) say trade is a very good thing, compared with around a quarter (26%) of Americans who hold such intense views. German and American men are more likely to say trade is a very good thing than are their female compatriots. High-income individuals and those with a college degree in both nations are more likely than those with a low income and without a college degree to take the view that trade is very good for their country. Americans and Germans generally share the view that increasing trade with a range of other countries would be beneficial. But they differ somewhat on the value of such commerce when it comes to specific prospective trading partners. 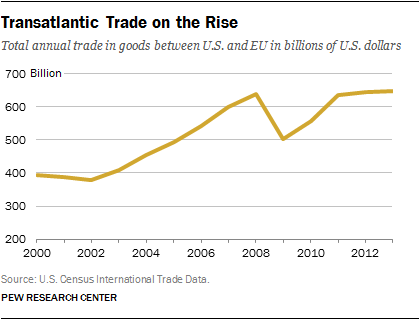 The United States and the European Union are each other’s largest merchandise trading partners. In 2013, bilateral commerce totaled $649 billion, according to U.S. government data. In that trade, America is Germany’s fourth biggest export market and source of imports. And Germany is the fifth largest trading partner of the United States. Given such extensive transatlantic commerce, it is hardly surprising that, in principle, Americans and Germans overwhelmingly support more bilateral trade and endorse the broad objective of the Transatlantic Trade and Investment Partnership. Three-quarters (75%) of Germans say increased trade with the United States would be good for Germany. But just 18% say it would be very good. And 79% of Americans say increased commerce with Germany would be good for the United States. 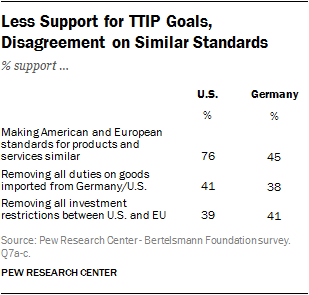 And, among these respondents, 29% say more German-American trade would be very good. In addition, roughly seven-in-ten (72%) Americans agree that more exports and imports with the European Union would be beneficial to the United States. Roughly twice as many men (29%) as women (15%), Americans with a college degree (36%) versus those without such a degree (16%), and high-income people (31%) versus low-income individuals (15%) say more U.S.-EU trade would be very good. Both Germans and Americans see benefit for their countries in boosting trade with many other nations. Japan is currently Germany’s 15th largest trading partner and the EU’s seventh biggest trading relationship. Japan is the fourth largest U.S. trading partner and Washington is currently engaged in negotiations with Tokyo to include Japan in the Trans-Pacific Partnership (TPP), a regional free trade agreement. In Germany and the United States publics are overwhelmingly supportive of increasing trade with Japan. Nearly eight-in-ten (79%) Germans say increased commerce with Japan would be good for Germany, while roughly three-quarters (74%) of Americans say more U.S. trade with Japan would be beneficial for their country. Germans and Americans also see eye-to-eye on increasing commerce with Brazil. That Latin American emerging market is currently the EU’s ninth largest trading partner but only Germany’s 22nd. Brazil is the ninth biggest U.S. trading relationship. Roughly two-thirds of Germans (67%) and Americans (64%) approve of boosting trading with Brazil, although – more so than with other nations – people are also likely to have no opinion on the matter. However, when it comes to trade with China and Russia, German and American views diverge. China is America’s second biggest trading partner, the EU’s second largest trading relationship and Germany’s number three international commercial partner. A strong majority of Germans (63%) but only about half of Americans (51%) say more trade with China would be beneficial to their country. Moreover, nearly three times as many Americans (20%) as Germans (7%) voice the view that more commerce with the People’s Republic would be very bad. Publics in Germany and the United States are also divided over more trade with China along generational and gender lines. More than seven-in-ten German men (73%) and more than half (56%) of American men, but just 52% of German women and 46% of U.S. women, favor more commerce with China. Similarly, 72% of Germans ages 18 to 29 and 59% of young Americans back more trade with China, while 61% of Germans 50 years of age and older and only 45% of older Americans agree. Such differences in sentiment may reflect the fact that, in 2013, the U.S. trade deficit with China was 36 times greater than Germany’s imbalance with China. The United States ran a $318.4 billion trade deficit with China, while Germany had just an $8.8 billion (€6.4 billion) shortfall. More than six-in-ten (64%) Germans say increasing trade with Russia, its fourth largest trading partner outside the EU, would be a good thing. (The Pew Research Center survey was in the field during Russian military movement into the Crimea.) Just 47% of Americans would like to boost commerce with Russia. Reflecting German and American support for increased bilateral commerce, more than half the publics in the United States (53%) and in Germany (55%) say that the Transatlantic Trade and Investment Partnership would be good for their country. Support for TTIP is shared by men and women, those with a college degree and those without a college degree. It is also shared across income groups in the United States. But high-income Germans (66%) are more likely to support TTIP than low-income ones (49%). Notably, however, more than one-in-four Americans (28%) and nearly one-in-five Germans (19%) volunteered they had either not heard enough about the negotiation, saw it as neither good nor bad, or did not know how they felt. 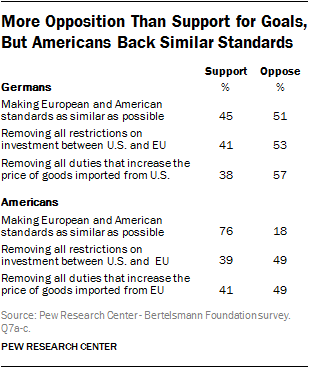 Americans and Germans express a range of rationales for supporting TTIP, with no single motivation predominating. About a third of respondents in both countries who think a U.S.-EU trade agreement is a good thing say it will help their economies. More Germans than Americans say it will strengthen ties between the United States and the European Union. Notably, Americans are much more likely than Germans to say that they think TTIP is good for their country because it will help their nation to be more competitive with China. (For more on American and German attitudes toward China see this Pew Research Center report.) 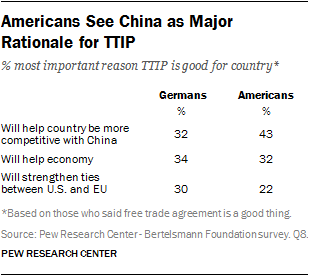 About half (52%) of Americans age 50 and older who support the agreement see China as a motivation for TTIP. The TTIP negotiation is multifaceted. It aims to reduce or eliminate tariffs on all merchandise trade across the Atlantic. Another goal is to remove restrictions on transatlantic investment. And, for the first time in any bilateral trade agreement, TTIP involves an attempt to come up with common technological and regulatory standards for the transatlantic marketplace, wherever possible. Roughly half the U.S. public (49%) opposes removing all duties that increase the price of goods imported from the European Union. And a majority of the German public (57%) opposes removing tariffs on products imported from the United States. However, German resistance to duty elimination is muted. Most of those in opposition (47%) say they are somewhat, not strongly, opposed. About half of Germans (53%) and Americans (49%) also oppose lifting investment restrictions between the United States and the European Union. Again, German opposition is mild. In addition, Germans and Americans are of two minds about the beneficial nature of foreign investment, with brick-and-mortar investments acceptable to publics in both countries, while takeovers by foreigners are largely unacceptable. Two-thirds (66%) of Americans say that European companies building factories in the United States will mostly help the U.S. economy. Men (71%) more than women (62%) support such greenfield investment. And, there is strong support for it among Americans with at least a college degree (84%). A smaller proportion of Germans, roughly half (49%), express the view that American firms building plants in Germany will benefit the local economy. Men (55%) are more supportive than women (43%), as are Germans age 18 to 29 (55%) compared with people 50 years of age and older (44%). German ambivalence about such new U.S. investment may stem from a distrust of American business practices. A 2012 Pew Research Center survey found that nearly two-thirds of Germans (65%) disliked American ways of doing business. Foreign-led mergers and acquisitions of German companies are decidedly unpopular. 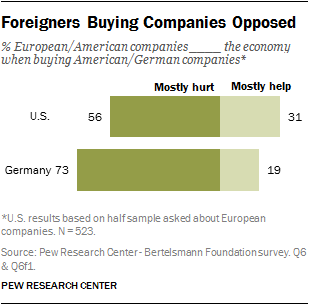 Just 19% of Germans say such foreign investment helps Germany, 73% say it hurts. Meanwhile, Americans are not that much more enthusiastic about foreigners buying U.S. firms. Just 31% back European takeovers, 56% oppose them. Moreover, women (61%) are more opposed than men (51%), and those without a college degree (59%) are more likely than those with a college degree (49%) to say such investment hurts . Some of the biggest differences between Americans and Germans involve the most ambitious TTIP negotiating objective: common regulatory standards. Roughly three-quarters of Americans (76%) support making American and European standards for products and services as similar as possible. This includes 35% who strongly back such efforts. Only 18% oppose similar standards. But just 45% of Germans support commonality, including just 13% who strongly back such an effort. And 51% of Germans oppose it. German reluctance to support similar transatlantic regulatory standards is driven by an overwhelming German preference for European regulations. On a range of consumer issues, Germans simply trust European regulatory norms more than American ones. For their part, Americans put more trust in U.S. standards, but their support is not nearly so lopsided. Washington and Brussels have long been at odds over the safety of genetically modified organisms (GMO) used in America – such as those in soybeans – and over the safety of U.S.-raised poultry and meat. The depth of that divide is evident in contrasting German and American sentiment. 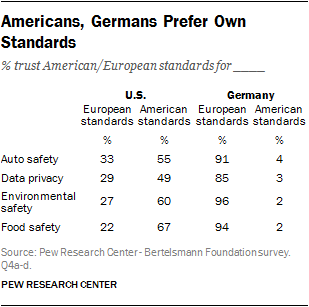 More than nine-in-ten Germans (94%) trust European food-safety standards while just 2% trust American regulations. Two-thirds of Americans (67%) trust U.S. standards. The United States is the world’s second-largest producer of motor vehicles. Germany is the fourth-largest manufacturer. Their publics each prefer their own auto safety regulations. But German confidence is greater. About nine-in-ten Germans (91%) trust German auto-safety standards more than U.S. ones. More than half of Americans (55%) trust U.S. standards more, although a third have greater trust in European . Revelations of U.S. National Security Agency spying on phone and email traffic have been sharply criticized by German pundits and politicians. This contretemps comes after years of transatlantic disagreement over commercial data collection and the movement of that information across borders, often by Wall Street financial service firms and Silicon Valley information technology companies. In the wake of such disputes, 85% of Germans trust European rather than U.S. data privacy standards. Barely half of Americans (49%) trust their own country’s confidentiality standards, although 23% of Americans trust neither European nor U.S. standards, or have no opinion. Finally, on environmental safety, 96% of Germans prefer European standards, while 60% of Americans back U.S. norms. Notably, age, income and education influence American trust in U.S. standards. Overall, young Americans, those age 18 to 29, are less likely to have faith in U.S. regulation than are people 50 years of age and older. And, in the case of environmental safety and data privacy standards, young Americans are actually divided over whether they prefer U.S. or European standards. High-income individuals generally trust U.S. standards, but to a lesser degree than low-income Americans. In the case of data privacy and auto safety, they are divided on whether they trust European or U.S. regulation. People with a college degree are less likely to trust U.S. standards than those with no college degree. TTIP is being negotiated at the same time as the Trans-Pacific Partnership (TPP), a free trade deal between Washington and eleven countries in Asia and Latin America. A similar proportion of Americans (55%) are supportive of the transpacific agreement as support TTIP (53%). One-in-five Americans (20%) oppose TTIP and one-in-four (25%) oppose TPP. While 19% of respondents say they had not heard of or had no opinion about the transpacific agreement, 28% expressed no view on the proposed European accord. Moreover, there is a partisan divide on both TTIP and the transpacific agreement. 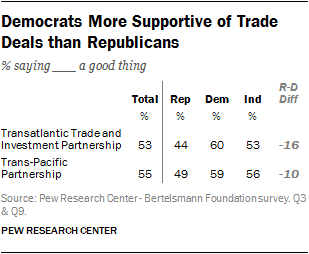 Fully 60% of Democrats say TTIP is good for the United States, but only 44% of Republicans agree. At the same time, 59% of Democrats back the transpacific accord, but only 49% of the GOP supports it. This partisan divide, in which Democrats are more supportive of trade than Republicans, runs counter to conventional wisdom in the United States and abroad that Democrats are protectionists and Republicans are free traders. However, such assumptions about partisan views on trade are not borne out by Pew Research surveys that have shown for some time that Democrats are more supportive than Republicans of growing trade and business ties between the United States and other countries. Notably, public support for both TTIP and the Trans-Pacific Partnership agreements generally exceeds public backing for the North American Free Trade Agreement during the time it was being negotiated, according to numerous polls in 1992 and 1993. Finally, TTIP is being negotiated at a time of rising anti-EU sentiment across Europe, including in Germany. A growing number of people are questioning some of the founding principles of the European Union (see the 2013 Pew Research Center report on the topic), including the right of the European Commission to negotiate all trade agreements for EU member states. Asked whether the European Union should negotiate international trade agreements on behalf of Germany or should the German government negotiate trade accords for Germany, by more than two-to-one (65% to 28%) Germans say Berlin not Brussels should be the negotiator. Support for this reassertion of the nation state’s role in international commercial agreements is particularly strong (73%) among members of the Christian Democratic Union, Christian Social Union and the Free Democratic Parties. Backing for returning this authority to Berlin is strong, but somewhat less so (60%), among members of the Social Democratic Party.